Haha, that's great! That's why I started reading "Eragon" and dropped it in the first pages and why I couldn't reach the half of "Game of Thrones". Brilliant! So funny! Well observed... In former times it could have been cowboy fiction or spy fiction or explorer fiction or historical fiction or outlaw or sheik or pirate fiction...there was some sort of research required for plausibility. lately fantasy is just making sh*t up, I'm sorry to say. The obligatory bang (whether explicit or implied) is a constant occurrence, though. This parody is very funny, especially with the reader's comments, but the story alone in a book would probably be a best-seller! https://www.youtube.com/watch?v=UqOOZux5sPE – I hope this isn't blocked in France … in case it is: Watch "2001: Odyssee in Space" for some space and spacecraft imagery accompanied by Strauss's "Blue Danube". Anathem was similar to that. It had it's own vocabulary, but at least you got used to it pretty quickly! Darnit!!! you did it again. Simply genius. I swear I do that every time I try to read one of those books. I even tried once to take notes of the names on a blank piece of paper. Of course I ended up just throwing the book away. if the author wants to make up their own dialect they'd might as well go all the way 'a Clockwork Orange' style. i want to read more books like that, but it probably takes a linguistics degree to pull off well. Doesn't Terry Pratchett write fantasy too? LOLOLOL!! I can relate with you Boulet!! ^^ I HATE it when I get confused with the characters! !Love your work, keep on keeping on!! As someone lives on the estuary of the Phutryd river, not far from Morglux, I love your characterization of it, and from now on I am now calling London Morglux and the Thames the Putryd. "Bernadette"? That's a silly name for a sword. How about "Mister Pointy". 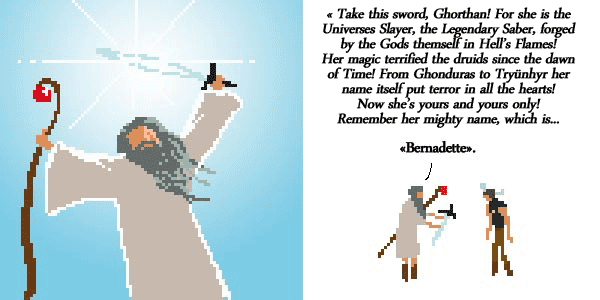 Have you played "Swords and Sworcery EP" ? The pixelated panels and the warrior really remind me of it. ...and I say to myself: What a wonderfull world!